Staying at home in their golden years is the first choice of many seniors. While lifestyle choices, desirable amenities, and available health services are important considerations, costs ultimately can be the most determining factor. Therefore it is important that you understand what in-home care really costs in order to decide if this is a feasible option. We will specifically focus on whether it is more cost effective to stay at home versus moving to a residential care home or assisted living facility. Furthermore, note that our discussion doesn’t take into account the advantages of home ownership or the obvious benefits of one on one in-home care. Assisted Living costs vary widely from state to state with the average base rate ranging from $2300 to $6000 monthly. The median national cost per resident is about $3500 as published by the Genworth 2014 Cost of Care Survey. Some assisted living residences add more fees on to this monthly rent in an “a la carte” fashion to further complicate this analysis. For example, will the facility do your laundry and at what cost? Will you have to pay for your own cable TV and Internet service? Remember to ask about charges for specific services and make sure that you are clear about all the fees upfront. The same Genworth survey published the national average of home health aides to be $20 per hour and homemakers to be $19 per hour. Applying this hourly rate of $20 for a caregiver means that home care costs about $4900 per month, which consists of 8 hours daily / 7 days a week. Following along this line of reasoning, the cost of home care is $1400 more than assisted living. However, when it is practical to hire a caregiver for 6 hours daily rather than 8 hours, or 5 days a week instead of 7 days, then the costs are very similar. For example, you can hire a caregiver during a regular 40-hour work week, and your monthly cost will be about $3500 (the same as assisted living). 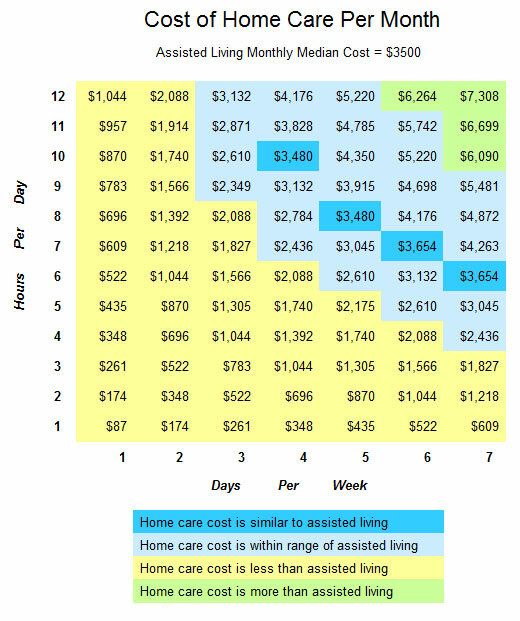 Home care costs are comparable to assisted living costs when you can prioritize caregiver hours in terms of duration and frequency. In addition, you can counteract the expense of home care with help from family caregivers. Adult daycare is another sensible care option to allow seniors to stay at home and is more cost effective than relocating to an assisted living community. The national average daily rate of adult day services is $65/day in 2014 per Genworth survey findings. At this daily rate a monthly average of 20 weekdays will cost $1300 for daycare with perhaps an extra monthly allowance for weekend caregivers costing another $1300. The total monthly expense of about $2600 combining in-home care and adult day care is still significantly less than the reported $3500 average monthly cost of assisted living. Strategically combining adult daycare with home care services can offer favorable reductions in costs to keep more in line with monthly assisted living rates. In conclusion it seems that upon initial inspection in-home care costs may seem to be generally higher than assisted living. However upon deeper scrutiny home care services may be less expensive with adherence to creative management of caregiver schedules and utilizing available family caregivers. Alternately enlisting adult day care on a part-time or full-time basis and/or supplementing with home care services opens up more possible savings. Therefore seniors preferring to stay home and hire outside assistance will be pleased to find in-home care rates that are competitive with assisted living.